Despite these, perhaps minor, failings, the book delivers to the reader a chilling litany of subterfuge, outright dishonesty, obfuscation and misinformation. According to the author, there is enough data that indicates potential and likely health concerns with the use of mobile phones, to warrant the issuing of strong warnings to users, especially children and teens. This data has been in existence since the early days of mobile phones. Despite this, the industry keeps calling for more studies to be done and governments, apparently at the behest or urging of the industry, relaxes safety regulations instead of strengthening them. A cynic might conclude from this that the profitability of the industry is more important than the health of users of the phones. 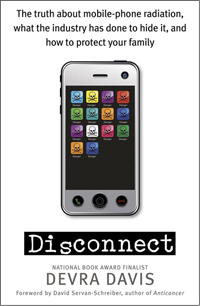 As with other books I have reviewed recently1, Disconnect should be read by everyone, in order that the size of the informed (and consequently concerned) public may grow to the extent that it may exert sufficient pressure on governments to offer all of us better protection. And we can choose to use these devices with more circumspection, or not at all. It is through the efforts of people such as Devra Davis that we, the consumers of ‘whiz-bang’ technology that we ‘cannot do without’, learn more about the consequences of using ubiquitous devices and can change our habits in an appropriate way.